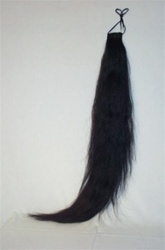 The 9-Layer Horsehair Tail Extension is 1½ lbs in weight and has a standard length of 55 inches. This tail extension is commonly used on Gaited horses However it can be attached and then cut across the bottom and used on stock breed horses. Because of its taper, the 9-layer is also atail extension to consider if you have a horse with a very short tail or a tail that has been chewed off. The extensions attach to the hairs of the tail bone in a similar manner as the wrap-around style. See our Instruction section for photo attachment instructions.